I’m fresh out of olive oil. How much would vegetable oil change the recipe. Everyone loved this kids and adults!!! Yay! So glad everyone liked it! Great recipe! 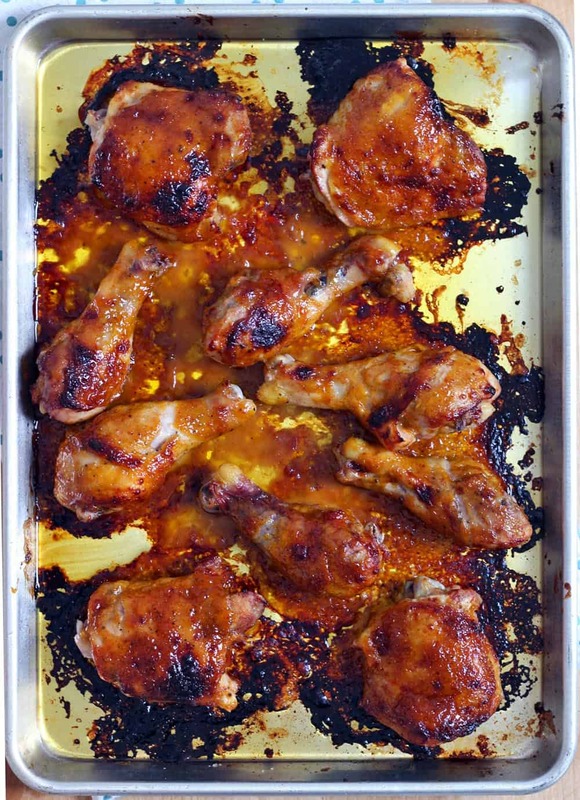 I used a stainless steel baking sheet, as sometimes aluminum will transfer, especially with stick bbq sauce. 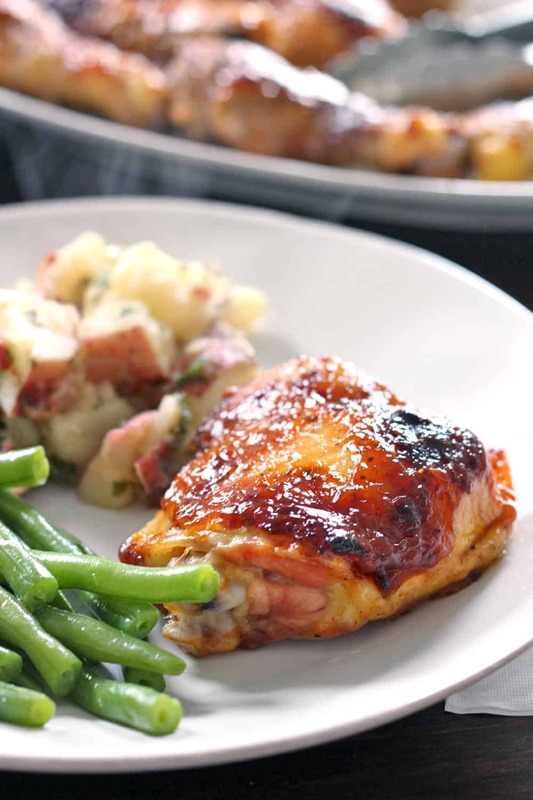 This is the best bbq chicken recipe, so easy for a weeknight & my 3 kids all devour it! Thanks!? So glad you and your kids liked it!! So good and juicy. Chicken was cooked perfectly. My 7 year old son loved it. So glad you and your son liked it! I followed your directions to a “t” and did not get desirable results. I’ll try it again. Aw, I hope it works out for you better next time! It might help to read through other readers’ comments on here- there are a lot of good troubleshooting tips. 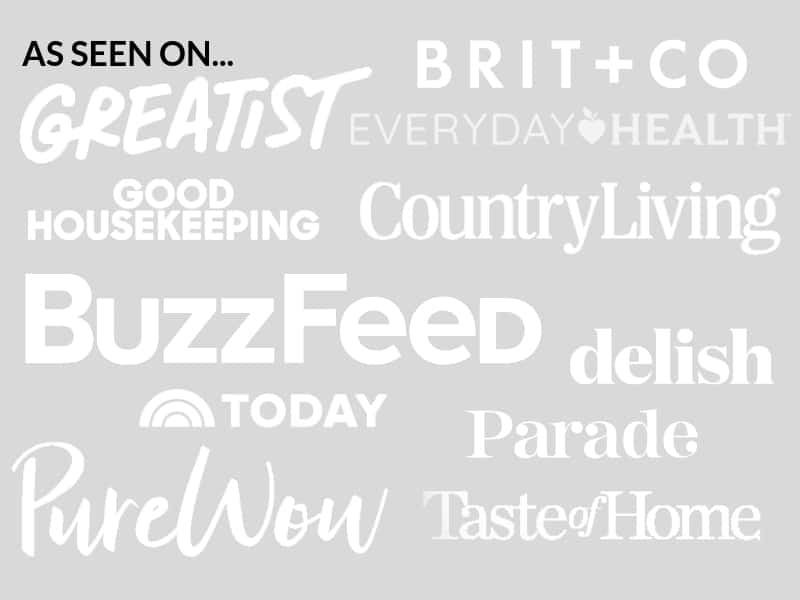 Let me know if there is something specific I can help you with. Good luck! Love love love this recipe! Have made it about once per week for past several months! Have made exactly per instructions and it’s awsome! I do now make with minor variations 1) cover pan with large heavy foil so you don’t have to scrub blackened stuff off pans for hours during cleanup. 2) yes I use legs & thighs: pull back skin from raw chicken. Make several deep cuts into thickest part of meat. Place in large bowl; add liberal amount of bbq sauce and massage into chicken being sure to work some into cuts. Allow to rest several hours/overnite. Just before cooking, pull skin back down into place. Proceed with above directions! This gets bbq flavor down into meat so it’s not all just on outside. Oh wow, I love these suggestions! Thanks so much, and so glad you like the recipe! Does it work with breasts? Sure! Bone-in, skin on will be fine to follow the instructions as is, with maybe just a little less time overall, since white meat cooks faster than dark. If they are boneless and skinless, they will cook much faster, so you’ll have to make some adjustments for the cooking time. I’ve never done it, but here’s what I’d do. I’d brush the sauce on them on both sides before even beginning to bake (season with salt and pepper also, and just grease the pan they will cook on). Keep the temp at around 375 the whole time. I’d say to cook for about 20 minutes total, taking out to brush more sauce on every 5 minutes, until the chicken is cooked through. Just check the internal temp for both ways to make sure it’s 165 degrees. Hope that helps! Made this last night. It was easy to do and my kids LOVED it! I used skinless bone-in thighs and the recipe worked perfectly. It required slightly less time but otherwise the same. So happy you and your kids liked it! Aw, yay! So glad you liked it! Oh my goodness. That was delicious and easy. Thank you. This is delicious! And easy! Miss my barbeque chicken in the winter and this is wonderful! Love this recipe! I have made it several times and tweaked it to suit the chicken I have on hand. One of my favorite new recipes! Thanks so much! Tried this today using a roaster pan to keep the chicken elevated away from the grease. It was great! So glad to have run across this today as I was about to prepare my usual bbq chicken. It was better than grilled bbq chicken! I use this recipe a lot. I grew up next to the salt lick as well!! Great bbq! I was very excited to see it in a recipe! I use this recipe in the winter time when I can’t grill outside and am NEVER disappointed! No matter what bbq sauce I use! This was quick, easy and delicious way to prepare BBQ inside! thanks. On the last two input times, are you flipping and basting both sides, or just the top/skin part? Good question! Assuming they are boneless as well? Since there is no “skin side” you can skip the cooking skin side down part. I’d season them front and back with salt and pepper and olive oil, and brush them with bbq sauce. Then, put them in the oven at 375 for 7 minutes. Remove, baste, and back in for another 7. And again, and again. This should be a total of 28 minutes. Check the internal temp at this point to make sure it’s at 165 or close to (and if it’s not. do another round). Chances are, the bbq sauce will have started to develop a glaze on top. But you may want to broil them at the top of your oven for 2-3 minutes after they are done to get some charred, crispy parts on top and really thicken the sauce up. One other thing to keep in mind- because they have less fat, they will have a tendency to stick to the pan more. I recommend using more oil on your pan, or putting them on some oiled aluminum foil so you don’t end up with a sticky mess. Hope that helps! Sure! They will cook much faster though, so you’ll have to make some adjustments for the cooking time. I’ve never done it, but here’s what I’d do. I’d brush the sauce on them on both sides before even beginning to bake (season with salt and pepper also, and just grease the pan they will cook on). Keep the temp at around 375 the whole time. I’d say to cook for about 20 minutes total, taking out to brush more sauce on every 5 minutes, until the chicken is cooked through. Hope that helps, and hope your girls like them! I love this recipe! This time I’m making it for a bigger crowd do you think with 14 drumsticks I should change the cook time or temp of the oven? So happy you like it! It should be fine with the same cooking time and temp, as long as it all fits on one pan and isn’t too crowded. You should be fine, since drumsticks are pretty small! Love this recipe! Super easy and a huge hit in my house! What are your thoughts on using Sweet Baby Rays teriyaki sauce? I’m hoping it would have the same effect and be just as delicious! So happy you liked it! I think that sauce would work perfectly. Maybe sprinkle with a few sesame seeds and green onions to serve? YUM! Omg delicious my kids loved it thank you ???? I use a whole cut up chicken. Only different thing I do is drain off the juices before basting with BBQ sauce. I also sometimes finish it off on the grill! 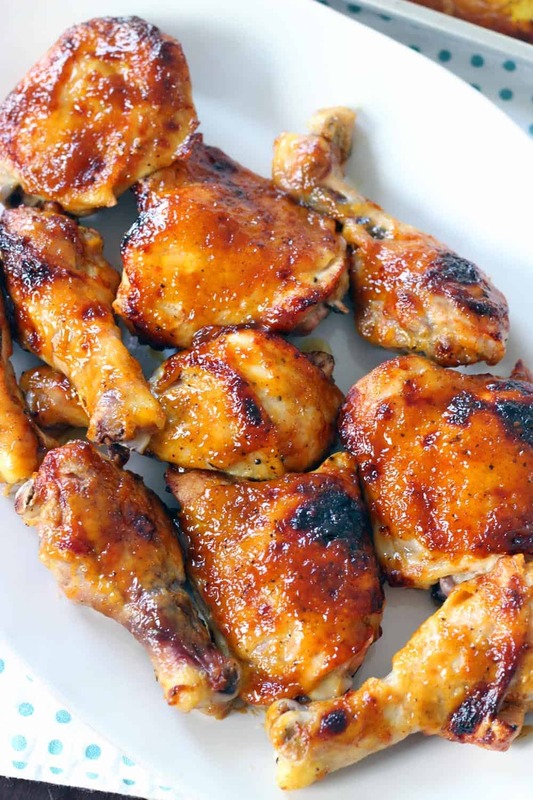 This is our favorite bbq chicken ever! ???? So happy you liked it! Love the idea of finishing on the grill to get those extra crispy blackened parts. I’ll have to try that! I just made this with a mustard BBQ sauce. It was so good! My family loved it too. Oooo I LOVE mustard BBQ sauce! I’ll have to try that next time. So happy you liked it! This dish made a greasy splattered mess of my oven. I was actually afraid of a fire and I had just cleaned my oven three weeks ago. Is the pan supposed to be covered? Nope- pan should definitely not be covered, since the skin won’t get too crispy! Hmm…my initial thought is that your oven may be a bit hotter than mine. I’d try a few things, if you didn’t the first time: make sure your oven rack is in the middle of the oven rather than the top, use a bit less olive oil (just enough to coat the chicken), and turn down the heat like 15 degrees or so to see if a cooler oven helps. Sorry that happened to you, and hope you were able to clean everything OK! 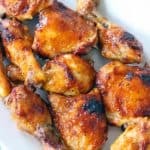 I use this recipe for the first time, and my barbecue chicken turned out great! however, I did bake my chicken a little bit too long due to not responding to my timer on time. Otherwise it will was excellent and I will definitely use this recipe again. Thank you so much! Need to increase initial cook times to 40 minutes. After basting three times with bbq sauce I checked and the chicken was not done in the center. Oh no! Thanks so much for the heads up. I always find that mine cooks all the way through, but there is so much variance in both chicken piece size and oven temperature that I definitely recommend using a meat thermometer or cutting into the chicken to make sure it’s completely done before serving. Luckily, it’s hard to overcook bone-in, skin on dark meat, so adding another few minutes shouldn’t affect it even if it is all the way cooked! Great recipe! I’ve made it several times. Yes- as mentioned above, the cooking technique is very similar! 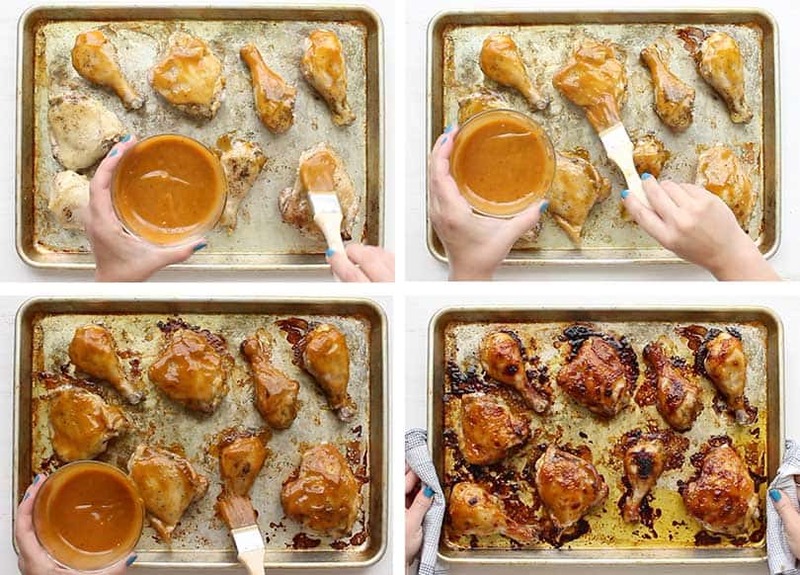 Love it- it makes the perfect sweet and sticky glaze every time.